KUALA LUMPUR (April 6): Malaysia's growth in export numbers could be undermined by the US's potential protectionist policies, such as import tariffs and renegotiation of free trade agreements, as it is one of Malaysia's major trading partners, according to an economic report released by TA Securities today. "The materialisation of more protectionist policies in the US could also derail the recovery in global trade, with broad ramification at home and among its trading partners, especially in Asia, which accounts roughly about close to 70% of the US goods trade deficit," the research firm said. "Such policies might improve US economic conditions in the near term, but the long-range effects of protectionism — from proposed tax reform to import tariffs and potential renegotiation of free-trade agreements — would be negative, both domestically and globally, with particular impact on countries such as China," it added. Malaysia's February exports grew 26.5% year-on-year (y-o-y) to RM71.8 billion while imports swelled 27.7% to RM63.1 billion, according to the nation's statistics department. The growth in exports was driven mainly by higher demand for manufactured goods, particularly electric and electronic (E&E) goods, and a growth in demand from trading partners such as China, for which imports grew 47.6% y-o-y. 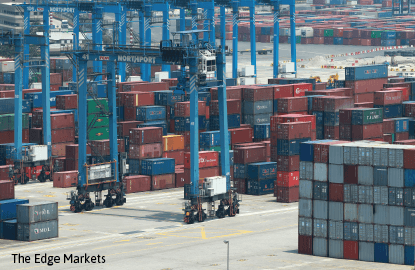 TA Securities added that if Malaysia's top trading countries such as China retaliate to protectionist policies by the US, it could increase the chance of a global trade war, ultimately jeopardising Malaysia's future trade outlook. Meanwhile, CIMB Research has revised its gross export growth forecast to 7.3% in 2017, from 5.5% previously, to account for the higher-than-expected expansion in trade. In an economics note released today, CIMB said the 61.1% y-o-y increase in the volume of February palm oil exports caught it by surprise, as the Malaysia Palm Oil Board statistics indicated that palm oil export volumes increased just 2% y-o-y in February. According to the firm, the jump in palm oil exports volume is at its highest since August 2011. The firm added that consumption goods imports, which saw a decline of 0.6% y-o-y in February, are likely to remain subdued in the first half of 2017 (1H17) but will see a gradual recovery in 2H17. "The export upturn has legs in 2017, riding on a resurgent global capex cycle, recovery in palm oil exports, stabilising oil prices, and the weaker ringgit," it said. "However, our GDP forecast is intact at 4.2% in 2017, as the increase will be offset by higher import growth, diluting the upward effect on net trade," it added.